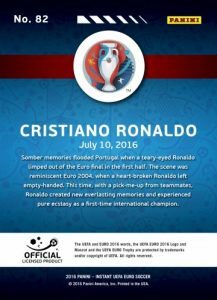 Bringing the excitement of UEFA Euro 2016 to collectors in a very short timeframe, 2016 Panini Instant Euro Soccer utilizes a real-time printing process to highlight key moments that can be purchased almost immediately after they occur. 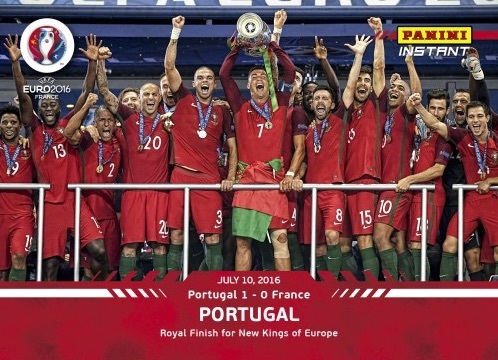 Released each day between 12 PM and 1 PM CST, 2016 Panini Instant Euro will feature "the biggest moments, milestones and performances" of the tournament that pits the top national teams in Europe against one another during June and July. Exclusive to the Panini Online Store, the individual cards will only be sold for 24 hours. Red base versions will be numbered on the back to reflect the exact print run and there will be even more rarity offered with a trio of parallels, including Green (#/25), Blue (#/5) and Black (1/1). One of the biggest soccer tournaments in the world, Euro 2016 has a huge global following given the large talent pool and storied history of the teams. The tournament has been increased to 24 countries for the first time ever, and includes notable participants like Germany, Spain, England, Portugal, Belgium and Italy. UEFA Euro 2016 officially begins on June 10 and runs until July 10. The 2016 edition of the tournament takes place in France. While 2016 Panini Instant Euro Soccer will only feature base cards and limited parallels, a traditional card product is also available for Euro 2016. 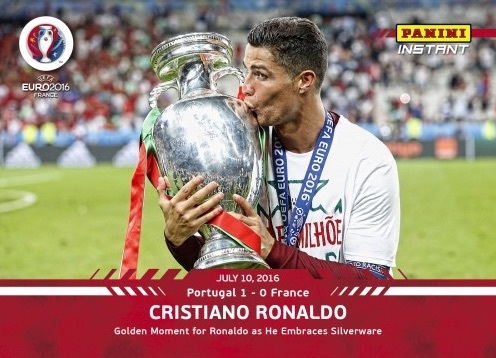 The chromium 2016 Prizm Euro set includes a variety of base and insert cards as well as autographs for top players like Cristiano Ronaldo. Specific cards will be updated on the checklist tab above. Full print runs will be added as they are revealed. There is also a similar Panini Instant release for 2016 Copa America. Shop for Instant Euro cards on Panini.